Juliet has been chief executive of the Stroke Association since June 2016. Prior to joining the charity, Juliet worked at Macmillan Cancer Support for 16 years in roles including head of planning and policy, director of corporate development and executive director of services and influencing. In this last role she led a staff team of over 800 people, managed a budget of £150m and oversaw a programme of award-winning innovations and service design across the UK. She also secured important government commitments to improve patient experience and post-treatment support through the 2015 Cancer Strategy for England. Prior to Macmillan, Juliet worked at the British Red Cross in strategy and service evaluation, the Community Development Foundation in fundraising and a political consultancy. 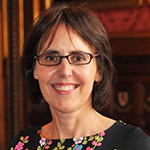 She was a trustee of the Long-Term Conditions Alliance and chaired the Cancer Patient Experience Board for University College London Hospital (UCLH) from 2011 to 2014. Juliet has a degree in modern languages from Oxford and a postgraduate diploma in management.